A simple, sleek ear cuff made with the colors you choose! Looking for ear cuffs with your school colors? Or the colors of your favorite sports team? What about holiday colored ear cuffs? Or maybe you just want to show off your two favorite colors, or need something to coordinate with a new outfit. Now you can choose your own custom ear cuffs! You pick the colors you want. *See the images above for available wire colors. Please use the drop down menus near the "Add to cart" button to make your selections. *If you are buying more than one color combination you will have to add each ear cuff to your cart separately to avoid confusion with your order. 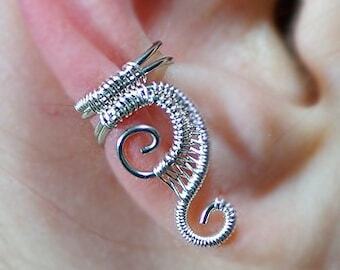 Ear cuff is approximately 2.5-3mm wide. Wire used is colored enameled copper (the natural copper color is uncoated copper wire). As described. Love the guitar part, but not crazy about the cord.